Today science and research management go hand to hand. 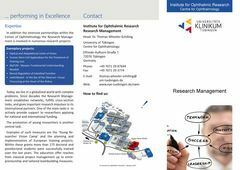 The Research Management Unit (RMU) initiates and supports the scientific profile of the Centre for Ophthalmology. Besides, the RMU acts as a strategic impulse giver and service provider in the area of visual research and ophthalmology on a local, national and European level. The spectrum of services encloses the science-political knowledge management, internationalization of the research, consulting and support of applications, outside representation, project management, network education, promotion of young researchers and communication. “Shape, steer, and allow: management adequate to science creates the clearances, science needs”.